Puteți descărca aici programul lunii aprilie. Vă așteptăm cu drag la toate evenimentele noastre! Puteți descărca aici programul lunii martie. Puteți descărca aici programul lunii februarie. Puteți descărca aici programul lunii decembrie. Puteți descărca aici programul lunii noiembrie. Puteți descărca aici programul lunii octombrie. Puteți descărca aici programul lunii septembrie. Puteți descărca aici programul lunilor iulie-august. Puteți descărca aici programul lunii iunie. Puteți descărca aici programul lunii mai. Puteți descărca aici programul lunii aprilie. Puteţi descărca aici programul lunii mai. Puteţi descărca aici programul lunii aprilie. Puteţi descărca aici programul lunii martie. Puteți descărca aici programul lunii iulie. Puteți descărca aici programul lunii ianuarie. Puteți descărca aici programul verii. Puteți vedea programul lunii aprilie aici. Calendarul lunii martie poate fi consultat aici. Puteți consulta programul lunii februarie aici. Programul lunii ianuarie poate fi descărcat aici. Programul lunii decembrie 2013 poate fi găsit aici. Romanian-trained Albanian violinist Alda Dizdari, praised for her suave interpretations, makes her debut in the Enescu Concerts Series with a recital full of melancholic fervour, which brings to life the enchanting harmonies of La Belle Epoque. Alda will be accompanied by pianist Tom Blach. In the programme: Enescu, Chausson, Sibelius and Ravel. The third and last episode in the popular Wild Carpathia series takes us to Northern Romania and the Maramures - one of the most picturesque regions in The Carpathians. Presenter Charlie Ottley and his companions also explore also the scenic views of Moldova and Bucovina, where they marvel at the Painted Monasteries. The trip culminates with a conversation with HRH The Prince of Wales, an enthusiast of multicultural Transylvanian traditions. 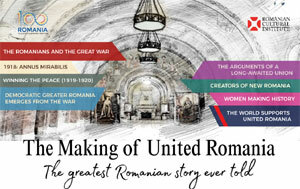 The special screening and the following reception are organised by the Romanian Embassy, with support from ICR London. Romanian artists Florin Flueras and Alina Popa take part in Currency, London's newest dance festival, a common initiative of The Place, Crying Out Loud, EUNIC London and the EU Commission Representation in London. Some of the best choreographers on the continent congregate in London to recreate Europe with turns, spins and chaines. We are delighted to host the 4th edition of one of EUNIC London’s flagship programmes, the annual conference of international cultural cooperation and cultural diplomacy. The event will bring together some great European names in the arts, academia and public affairs that will offer their contribution to the essential debate about the future of Europe. Romania is represented by Gabriela Adamesteanu, one of the country's most prominent novelists and public intellectuals. The Trajan 1900 programme opens in 1 Belgrave Square with a 3D photography exhibition by architect Matei Filip, portraying the dramatic narrative of the great emperor’s conquest of Dacia. A partnership with the National Museum of Romanian History, the exhibition will present 125 scenes from the cast of the Column in Bucharest, offering a fresh perspective on the amazing story and sculptural detail of the timeless monument. Columna (The Column), a grand cinematic chronicle of the most consequential moments in European history, directed by Mircea Dragan, screens at the Romanian Cinemateque. A star-studded international cast, crowned by Richard Johnson, Amza Pellea and Antonella Lualdi, the film portrays one of the most ferocious battles of the Ancient World, that between Trajan’s Roman legions and the Dacians led by the valiant king Decebal. V&A's replica of Trajan's Column is brought to life in a spectacular show of video mapping, projections, lasers and soundtrack by innovative visual artist Dreamrec and musician Rochite. The show, preceded by a documentary about the Column and its significance, will run in the museum’s Casts Court, as part of the Late at the V&A. Dr Ernest Oberlander-Tarnoveanu, Director of Romania's National History Museum, joins a select ensemble of British specialists and enthusiasts of Roman history, to discuss the story of Trajan’s Column in Rome and of its impressive casts in London and Bucharest, as well as the legacy of the timeless monument for Romanian identity and international artistic heritage. The latest Romanian robotic inventions will feature, for the first time, in the Robot Safari EU festival, a showcase of scientific imagination, which will take place at one of London's landmark cultural scenes, the Science Museum. The creators of the three Romanian biomimetic robots - DodecaRob, Jellyfish and Piranha - come to London to demonstrate the skillfulness of their amazing machines. Right on the National Day of Romania, we celebrate the birth of our cinema with an exceptional screening of the first full length feature, The War for Independence (Independenta Romaniei, 1912) presented in the Barbican Cinema's Silent Film series. The film will screen with live music performed by London based American composer and pianist Lola Perrin. We continue the tribute to one of the world's most enigmatic and daring pioneers of flight, Aurel Vlaicu. A mechanical genius raised from humble origins to international fame and an aviator of reckless courage, Vlaicu was an important figure of the 20th century tremendous technological revolution that conquered gravity and put man in the skies. A UK premiere, the exhibition showcases a replica of his flight machine. Thanks to the generous support of several publishing houses present at the London Book Fair, the collection of the Romanian Library has been enriched with more than 230 of the latest Romanian books of fiction, as well as with useful reference books. Make your pick by visiting the newly launched Library webpage, including an online search catalogue (by author, title and domain), a list of the Romanian books in English, the book & quote of the month and the literary calendar. The House of Romania, situated in the prestigious Belgrave Square, one of the grandest and largest 19th century squares in London, has a rich history. It was erected in the 1860s, was appropriated by the Romanian government before WWII and has functioned as embassy, ambassadorial residence or cultural institute ever since. Our enthusiastic friends from Adrienne Photography have finished a short video documentary that takes us into all corners of this majestic building. Start the tour! The Romanian Cultural Institute is proud to open its 2013-2014 season of the Enescu Concerts Series with a piano extravaganza celebrating the genius of Constantin Silvestri at 100 years since his birth. The concert is presented by renowned pianists Anda Anastasescu and Alberto Portugheis, joined by oboist Aurel Marc and two of the Silvestri Scholarship alumni, Octavia Marc Raceu and Daniel Ciobanu. The funny, intelligent and vibrantly compassionate performance Once upon a Second Time, by Mimi Branescu, starring Vlad Zamfirescu and Mirela Oprisor, will open the theatre series Tales Told in Romanian to the British audiences. The play captures the ups and downs of life in a hilarious and poignant manner, speaking about the idea of a second chance in love and the complicated relationships between generations. The festival will present a wonderful range of events, featuring acclaimed artists and intellectuals as well as the best of Romanian classical and contemporary music, film, spoken word, wine & cuisine. Our guests include highly praised musicians Remus Azoitei and Eduard Stan, film director Stere Gulea, historian Adrian Cioroianu, poet Doina Ioanid, flamboyant saxophonist and DJ Lucian Nagy and his Triolectric band, and wine guru Dan Balaban. Join us for seven unforgettable evenings of thrills and spills! In its fourth year, our partnership with the British Film Institute brings to London the year’s best Romanian films and helmers for a series of illuminating events. Join us for the screening of 2013 Golden Bear winner Child’s Pose (Pozitia copilului), followed by a conversation with director Calin Peter Netzer. Don’t also miss acclaimed Adrian Sitaru’s short House Party (Chefu’). The Romanian Cultural Institute and The London Chamber Music Society present George Enescu's magnificent String Octet within the 2013-2014 Classical Season at Southbank Centre, the Purcell Room. Alongside Enescu’s masterpiece, the programme features the Second String Sextet by Brahms. The recital will be performed by one of the most reputed British ensembles, The Chilingirian Quartet, and guest string soloists Horia Vacarescu – violin, Alexander Sitkovetsky – violin, Vladimir Mendelssohn – viola and Alexander Chaushian – cello. Alex Drace-Francis and Ruxandra Trandafoiu, the authors of the newest Western incursions into our national soul – The Traditions of Invention. Romanian Social and Ethnic Stereotypes in Historical Context (Brill Publishers, 2013) and, respectively, Diaspora Online. Identity Politics and Romanian Migrants (Berghahn Publishers, 2013) - examine the stereotypes, misunderstandings, and transformations of Romanian identity at home and abroad in a pursuit of a multi-faceted, ever-changing reality. The Romanian Cultural Institute is proud to invite you on a musical journey to mysterious Byzantium in the company of acclaimed men’s choir “Saint Demetrius”. The Craiova-based group promises a rare musical experience featuring grave, ravishing tonalities of the Orthodox Church music, which is seldom performed in Britain and almost never in English. One of European musical scene’s most endearing and charismatic couple, French composer and pianist Thierry Huillet and acclaimed Romanian violinist Clara Cernat, will take us to a vivid musical illustration of Antoine de Saint-Exupery's classic story, The Little Prince, as part of the 2013 Kings Place Festival. ICR's training and coaching scheme in cultural diplomacy continues with the arrival of cultural manager and artist Ghenadie Sontu, the fourth winner of the scholarship since the programme's launch in the summer of 2011. Come and discover the shapes and volumes of a grand mansion, full of rich history, the work of Thomas Cubitt - perhaps the most important figure in the building industry for the first half of the nineteenth century. Our doors are wide open for lovers of elegant halls, adorned with old furniture and paintings by great Romanian artists. The Romanian Cultural Institute honors legendary singer Maria Tanase (1913-1963) with Maria T, a touching musical homage composed by Romanian-born composer Alexander Balanescu and performed by his quartet with a visual echo by Klaus Obermaier. Join us in the celebration of one of the world's most enigmatic and daring pioneers of flight, Aurel Vlaicu. A mechanical genius raised from humble origins to international fame and an aviator of reckless courage, Vlaicu was an important figure of the 20th century tremendous technological revolution that conquered gravity and put man in the skies. A UK premiere, the exhibition showcases a replica of his flight machine, as well as the original helmet and flying gear worn by the aviator during his last flight. The opening of the exhibition Romanians Against Gravity: Aurel Vlaicu, Flight Daredevil, commemorating 100 years from the death of the legendary aviator, will also include the screening of Mircea Dragan's touching biopic Aurel Vlaicu (1977). In Romanian with English subtitles. We are delighted to host the launch of the Modern Poetry in Translation summer issue Between Clay and Star including a feature on Romanian poetry. Four of the most exciting Romanian poets, whose work spans the twentieth and twenty-first century, Ana Blandiana, Gellu Naum, Dan Sociu and Liliana Ursu, are all represented in fine new translations. A night to remember with poetry readings and Romanian music performed by Monooka's Caravan. We’re back in St. Martin-in-the-Fields’ most popular concert series, “Pianist of the World”, with a recital offered by indefatigable musician and cultural animator Irina Botan. The programme includes pieces by Haydn, Chopin, Rachmaninoff as well as a piano composition by revered Romanian composer Mihail Jora, which will be performed for the first time on the popular musical stage of Trafalgar Square. The popular Romanian Cultural Institute Series at St. Martin-in-the-Fields is welcoming acclaimed harpist Paula Popa and violinist Florica Grigoras, in a rare treat of ethereal scores. The duo will perform timeless works by Ciprian Porumbescu, Luigi Maurizio Tedeschi, Pablo Sarasate, Jules Massenet and Camille Saint-Saens. Theatre critic and professor Octavian Saiu joins a select ensemble of British specialists in and aficionados of Beckett, comprised of journalist Jeremy How (BBC Radio 4), dramatist Jonathan Myerson, Derval Tubridy (Goldsmiths College) and Mark Nixon (Beckett scholar), to discuss the great Irishman's relevance today and his innovative ways of staking his work. The RADAR Concert Series was created by Mercury Quartet at London’s trendy and intimate The Forge Club in Camden and represents the ensemble’s aim at discovering and showcasing the most exciting emerging composers alongside masterworks of the 20th and 21st century. The fifth consecutive collaboration with our friends from the East End Film Festival brings to London one of the most anticipated Romanian films of 2013: Marian Crisan’s Rocker. We are pleased to support lead actor Alin State’s presence in London for a Q&A session after the screening. Do not also miss Trois Exercises (dir. Cristi Puiu) on 6 July, 2pm @ Genesis Cinema. For two days, 1 Belgrave Square will become the setting for a professional exchange that brings together dignitaries, heads of state, ministers, politicians, diplomats, academics, authors, human rights activists, journalists, and artists with the aim of debating the role of culture in international relations. The event's main organiser is the Institute for Cultural Diplomacy in Berlin, and will also be hosted by the House of Lords. The Romanian Series at the popular St Martin-in-the-Fields in Trafalgar Square resume with a concert by violinist Eva Demeter and pianist Theodoros Iosifidis who will make the music of George Enescu resound once more on the prestigious venue in central London. The masterful duo present a programme including, besides Enescu, works by Mozart and Janacek.